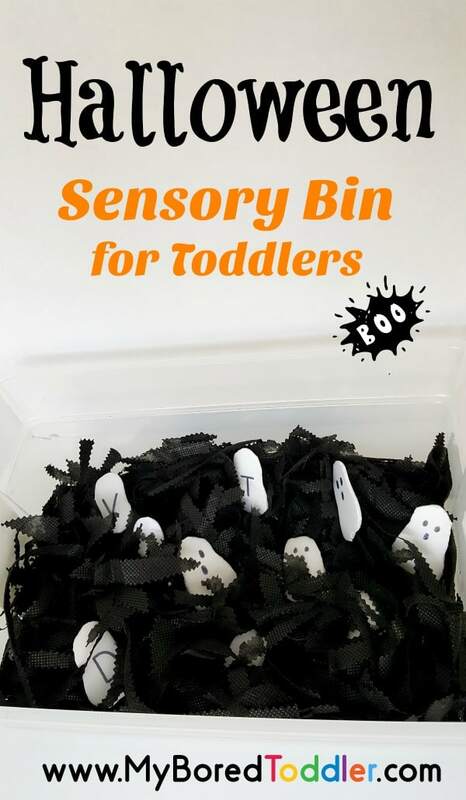 A Halloween ghost sensory bin is perfect for toddlers celebrating this holiday. It’s simple enough to set up and not as scary as some of the other Halloween activities out there! This is a fun Halloween sensory activity that I know you’ll love! These days everything is coming up Halloween. 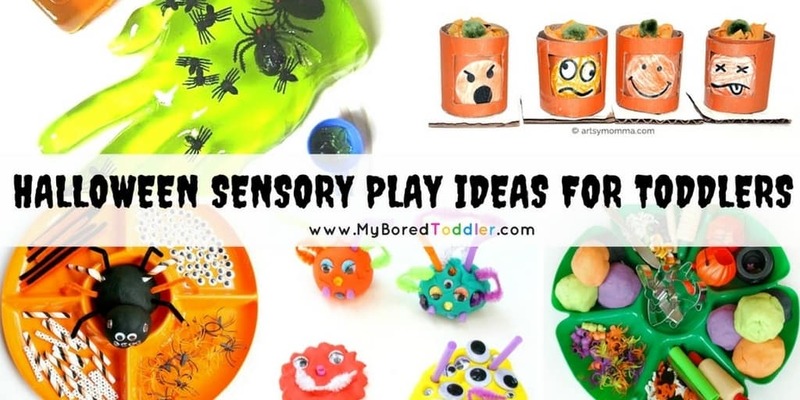 Adding a Halloween theme to the sensory bin is an easy way to add some un-scary fun to the seasonal activities. This sensory bin is easy to put together, and takes advantage of some everyday materials that can be recycled into toddler play. 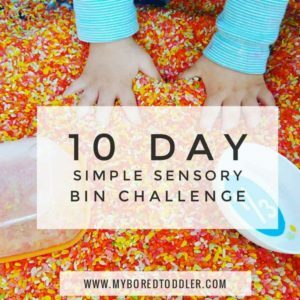 Sensory bins are always popular on our site (you can see some of our favorites HERE) and sensory play provides your toddler with opportunities to engage in fine motor and language skills along with the sensory experience. 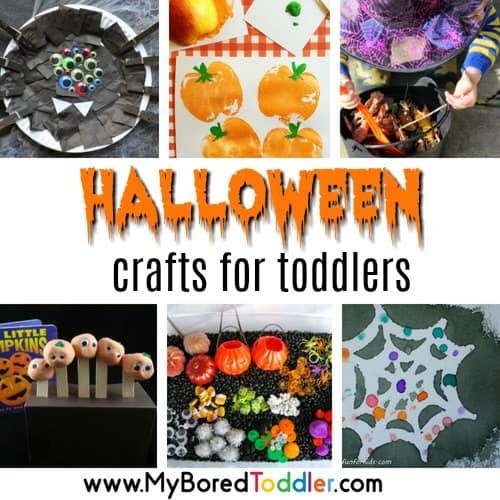 Sifting through a variety of textures with bare hands; making small hills, or dragging all the material into one side of the bin or the other; recognizing and naming colors, letters or numbers; these are just some of the ways your toddler can engage with this Halloween-themed sensory bin. This sensory bin is made with recycled foam trays and lightweight black fabric. You will also need some scissors or pinking shears to cut the fabric. 1. Cut ghost shapes from white foam trays. 2. Draw black eyes and mouth on one side of each ghost. Put a letter of your toddler’s name on the opposite side of some ghosts, then add other letters of the alphabet to the remaining ghosts. 3. 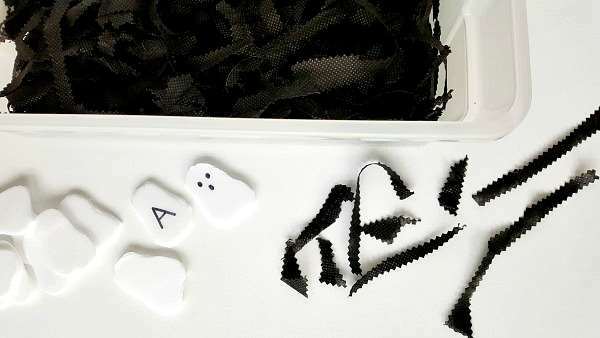 Cut black fabric into small pieces or strips with pinking shears. 4. 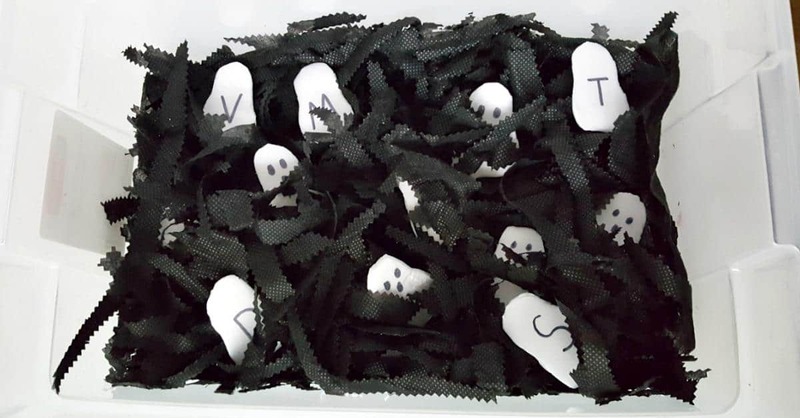 Fill a medium size bin with the fabric and add the ghosts. Bury some ghosts in the bin and place some on top of the fabric. There are other options for making the bin. • You can shred or tear black tissue paper to fill the bin instead of using fabric, but the fabric – whether cotton, silk or any other lightweight fabric – provides a unique sensory experience. The pinking shears give the fabric added interest visually! 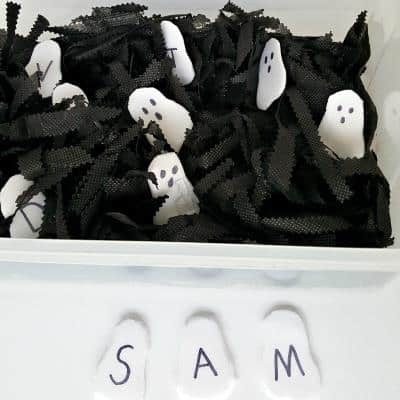 • Cut ghosts from white cardboard or foam sheets. Your toddler will love finding the letters of his name in the sensory bin. If your bin is large enough you can add all the letters of the alphabet. You can also add numbers to be recognized and named, and sorted from 1 – 10.When your toddler is ready, make simple words like ‘mom’ or ‘cat’ with the letters you find. Then bury the ghosts in the sensory bin to play again! The sensory bin is a simple yet effective place for toddlers to play and learn. 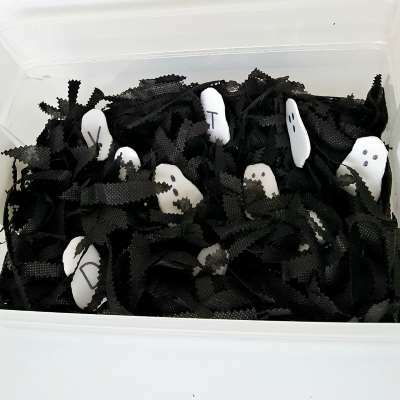 Adding friendly ghosts to the sensory bin is a great way to jump-start the Halloween fun!